This week it's The Uncommon Bottom's turn at being our Featured Retailer! Want to learn a little more about the sisters who own and operate it? Read our interview and get to know them a little better. Tell us a little about yourselves, your family, if you have little ones in cloth diapers, etc.- Laina & Mieken are sisters and co-owners of the Uncommon Bottom. I am stay at home mother of 1 year old boy (in reusable diapers). I am married to a very supportive husband who loves cloth diapers and the business. In my spare time I love to read, go on walks & sew. Other hobbies I enjoy are canoeing, camping, biking, & decorating. Mieken is a Recreational Therapist. Also married to a very supportive husband. She enjoys all things outdoors, but especially skiing and rock climbing. She loves to cook, read, and sew. Where is The Uncommon Bottom located? We are located in beautiful Salt Lake City, UT. How did you get started cloth diapering and what made you decide to open your own business? I always imagined myself using cloth diapers. It is what my mom used and she loved them. I have always had a love of the environment and do what I can to help preserve its beauty. Disposables were just never an option for me. After doing a LOT of online research to try and find the best cloth diaper for me and my baby I found a real interest in reusable diapers and decided I wanted to make the process of using cloth easier for others. This is what started my adventure of opening my own business. I wanted to help parents interested in reusing have an easier time than I did. I wanted to help people find the perfect diaper for them, their baby, and their budget. And that is what I am currently doing. What do you like best about being in the Cloth Diaper Industry? I love getting to associate with parents that are so excited to start using cloth. I love talking to parents about their children. I love being a part of a change for the better. What are your favorite Knickernappies products and why? I LOVE the LoopyDo insert. Absorbs well and drys quickly, a great combination. 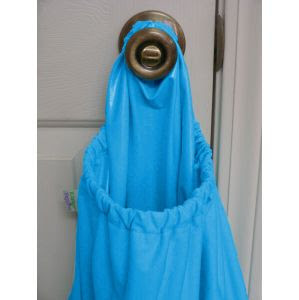 I also love the Doorknob Diaper Pail. It is the perfect solution to an easy to pack diaper pail while we travel. Want to keep up with Uncommon Bottom? Follow their Blog for all their updates, sales and more at Some Uncommon Blogging. Become a FAN of Uncommon Bottom on FaceBook HERE. *Special Offer: Knickernappies OS Diapers are 10% off from May 14-May 21st!